It was really demanding to conduct the review of the 10Markets. It does not happen that often than you are able to find such a platform with so many options, that is so streamlined and that is so easy to use. All of the things said in a previous statement are related to the 10Markets broker. The main ideas that lies behind the 10Markets is the ability to offer clients with one of the most advanced online options for retail financial trading that is at the same time user friendly and easy to use. While we were preparing the review of this broker we tried to focus on the aspects that deal with binary options trading. However, it must be said that besides the aspects about binary options, reader have the possibility to research many reviews that deal with the Forex and MetaTrader4 platforms of the 10Markets brokers on our official web page. 10Markets offers its clients three standard and one special account. In order to research for this review we used the account of the standard type. The following part of this review will deal with options for different accounts as well as what we thought about the experience of trading through this platform. 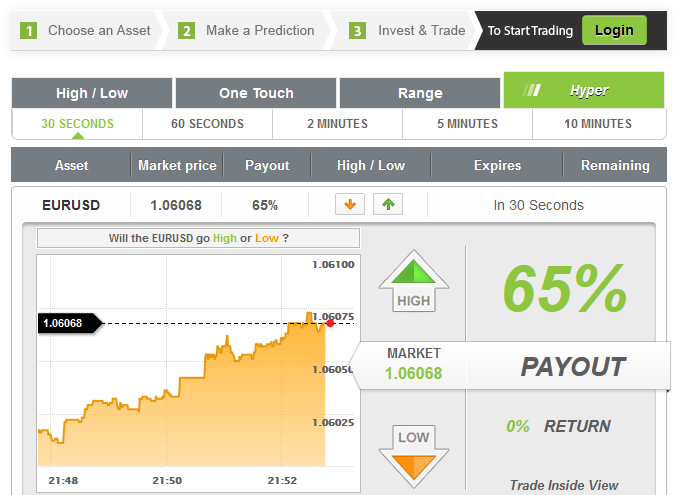 This review will present only information that are relevant for the traders of binary options. Tailor Made account on the 10Markets is a special type of the account that get created in accordance with the wishes of the customers. Due to the fact that this platform displays high level of flexibility, this is actually possible to do. Since a lot of good things about the 10Markets actually revolves around its platform, the following part of the review will deal with the exactly that issue. As we have already mentioned in this review, 10Markets enable their clients to participate in the financial market through several platforms offered by this broker, whether it is Forex, MetaTrader, CFDs or binary options. Besides this, they additionally offered several solutions for mobile trading as well. Before you actually start using the platform it is required of you to register and to login once you have your password. The process of login is actually pretty simple and fast. In this process, users are transferred to the ‘My’ aspect of the web page. After you have done this, it might look a bit confusing to you because in order for you to actually start trading you will have to go back to the home page of the web page. Besides this, the general evaluation of the entire control panel (“My10Markets) is that it worked very well and that it is very easy to set up the account. 10Markets offers standard, web page based platform for binary options trading. This platform is being provided by Panda TS. One advantage of this platform is that is on full screen and containing a big graph in the middle of the screen. On the left, there are options for Hype (60 seconds), once touch, high-low or range binary options and all of that depends on the preference of the client that is using the platform. The times of the expiry are in the range of 30 second to 10 minutes for the short time options and 15 minutes to 10 hours for high-low options. There is also a possibility for traders to choose the end of the day or the end of the week as the time of expiry. On the bottom of the page, users are able to see the list of the most recent winners and the most recent trades that have been conducted. This includes 6 stocks, 24 forex pairs 6 indices and 4 commodities. However, it must be mentioned that the number of options for binary options is lower. Another advantage of this broker is the fact that it provides a very neatly set up and placed tools for financial analysis. Users have the access to the financial calculator as well as to the economic calendar for the binary options, a thing that people from 10Markets call financial calendar. This is useful for people who like to keep track when some data come out and when markets move the highest amount of expectations or projection in the real time. In the development phase are the market clock and the tools for advanced management of portfolio. The features that are offered as a part of the support system of the 10Markets broker are chat feature, webform, phone call, e-mail. In these ways, clients are able to contact the staff that works in the support. According to 10Markets, their support system is available at any time 24/7. However, on their official web page, the part that contains the phone numbers states that the work from 10:00 to 18:00 UK time from Monday to Friday. After we attempted to live chat with the support team at 9:07, were not able to receive an answer for 10 minutes and because of that we concluded that the working hours written on the web page are true. There is not a lot of possibilities in regards to the range of the deposits. Options are standard MasterCard, Bank wire and Visa. In order to prepare for this review we used the credit card option. Minimum amount of the deposit is $200 with the minimum for trade being $10. This enables the traders to have 20 trades with the minimum amount for trading. The withdrawal of funds from the 10Markets takes usually 2 to 5 days. It was required to fill out the form in written, scan it and send it together with other required documents. In the end, the review of 10Markets proved to be very pleasant for us. However, one thing that we did not like was the it requires minimum of $100 for the withdrawal. The accounts on the 10Markets can be in EURO, USD or GBP. Unlike some other platforms, 10Markets does not charge any fees for the withdrawal. Binary Minery Review: 10Markets: 4.5 stars.